Are all of our posts at this point considered to be part of the Beta testing? I don't like not being able to add a photo from my computer if I want to. We should be able to do that. Not everyone has them at a site like Photobucket, they are going to charge people for photo storage. So we need to be able to upload from our computers. @Marty Walker all your posts will stay up on the forum, even though this is still a Beta version of the community! @Carol Binkley have you tried going to the button on the very right, hitting the dropdown and then hitting Choose File? Let us know what Browser you are user or what other information you might be able to provide. Thank you! I'm also failing at adding photos in my posts. Choose File isn't an option I see in the Attach Image Drop Down menu. I'm using Firefox 55.0.3. I see Insert An Image (which is not a live button) and Browse (which isn't helpful, as my photos aren't on my Desktop), and a URL box. I tried a URL in a post, but it turned into a link, not an image. Thanks, @Marty Walker — where are you hoping to add an image from? For the URL box, are you inputting the URL of the image itself? Let me know on details so we can help! My newer photos are in Shutterfly. In order to use those, I have to log in, find a photo, then save it to my desktop. I haven't tried iPhoto. Oh, I should add that I'm using a MacBook Pro, running OS X El Capitan v.10.11.5. Thanks @Marty Walker I'm looking into that for you! For now, it looks like the workaround is saving the photos to your desktop, then uploading. @DogsterAdmin - is the welcome forum the only place to post about our dogs? 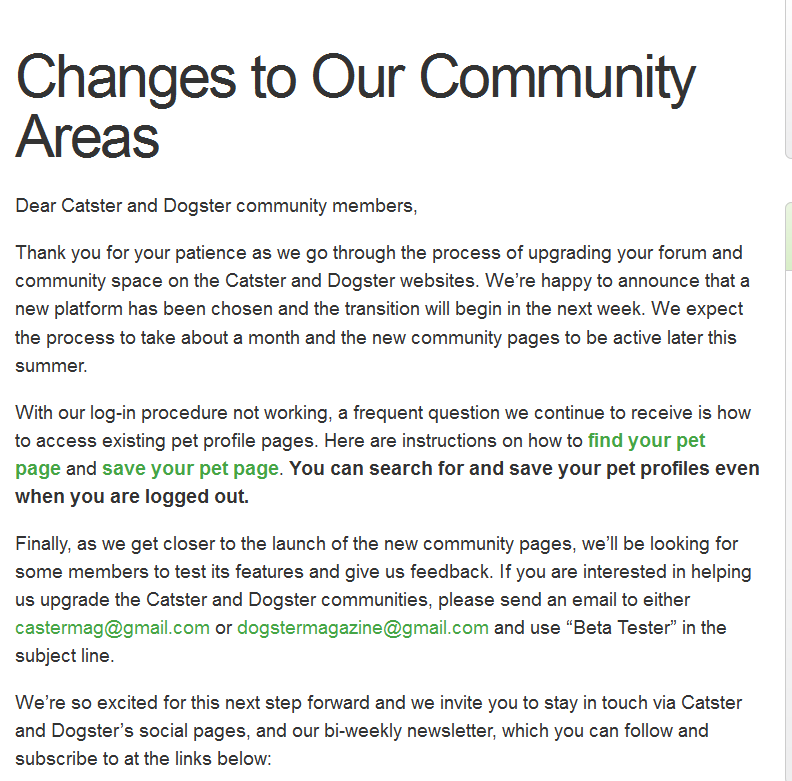 Will the pet pages that we had before Dogster went offline for update return? Thank you. where are my pet pages ? Why are you posting everyone's name? Where are all of our group threads with the pictures we posted of our parties, weddings and everything else we worked on for years and paid for???? Is Dogster even going to come back? Many of my friends are just as heart broken as I am . Why would you destroy everything from your loyal paying customers???? Hey @Baxter_MacKenzie ! The welcome forum is the new way to post about your pet. As we noted earlier this summer when we asked community users to save any content on their pet profiles, pet profiles are not preserved and will not be coming back in the same way that they were in the past. If you have ideas for updated functionality, please share them! Hi @Phylis! You can change your username at any time, please go to our FAQs section for directions. The FAQ section also lets you know where to find everything on this new forum. @DogsterAdmin thanks for the response. A small feedback would be investigating whether the 20 character limit could be changed to allow more characters and also symbols. Thanks @Baxter_MacKenzie we will take that into consideration! Not seeing the Me button? Or an edit option. Can you lay out the instructions here, step-by-step? Sorry, we're all new here! Oh wait! I did it!!! Woof!!!!!!! I'm Hershey! I do not see any button on the right and drop down to chose file. It would be on my page, right? Go to the little gear-y thingie on the far right. That's where Edit Profile is! I want to add photos on my page. Leave profile the same it is now. Here is where you suggested saving content but nothing about "pet profiles are not preserved and will not be coming back". @Pauline Green thanks! As is expected with any updates, a few things have changed in this process. Please note that you can make a new profile on our Welcome posts page. You can also update your username and photo to your pet's username and photo. I don't want to change my profile picture, just add pictures to my page of all my furs, that people knew. Go to your Profile Page, @Carol Binkley, and look under Activity at the top. There's an Image insterter there. Only, I don't don't know how it works. BOL! @Carol Binkley you can also make as many welcome posts as you'd like for each of your pets by copy/pasting the Welcome Post fields! It takes an image URL. We should be able to upload from a computer. Hey @Faye Nicholas — Catster's community is community.catster.com/. If you forgot your password, try forgot password and see if that works! I was able to upload photos of all my furs from Dog/catster on the Welcome thread, on my thread. But we should be able to upload photos on our own pages. For people to see.